Here is a compilation of my favorite iconic tourist attractions. The good news is there are so many great things to do in New York today that there’s enough to go around. This is part 2 of a series of four visual stories. Take a virtual walk looking at the unique Chrysler Building, enjoy the boardwalk and the amusement park at Coney Island; Ellis Island, a historic landmark in the middle of Hudson Bay; and the iconic Empire State Building. More: you will get to know the top secret stories of the Chrysler Building and the Empire State Building. Enjoy and have fun. When you arrive at Ellis Island, you feel like you get back to the days when the first immigrants arrived in the USA. You can trace the history of U.S. immigration with a visit to the three floors of objects, photos and interactive displays housed on the famous island next door to Lady Liberty itself. The exhibitions are a moving tribute to the people from so many countries, who made the journey to the United States of America filled with dreams for a better life. You can find highly informative audio tour in 9 languages. The novelty is a children's audio narrated by animal characters, available in five languages. You can check out info about the ferry to the Ellis Island here, and the ferry route on this map. If you would like to search for every single passenger who arrived and was processed through Ellis Island immigration service, click here. You might find a distant relative who was one of the 12 million brave immigrants that went to the United States of America in pursue of happiness. Ellis Island, the U.S. gateway to immigration from distant lands. A visit there, and to the nearby Statue of Liberty, can be emotional, even for those born in the U.S.
Coney Island is a residential Brooklyn neighborhood where people dive into a relaxation and entertainment atmosphere each summer. 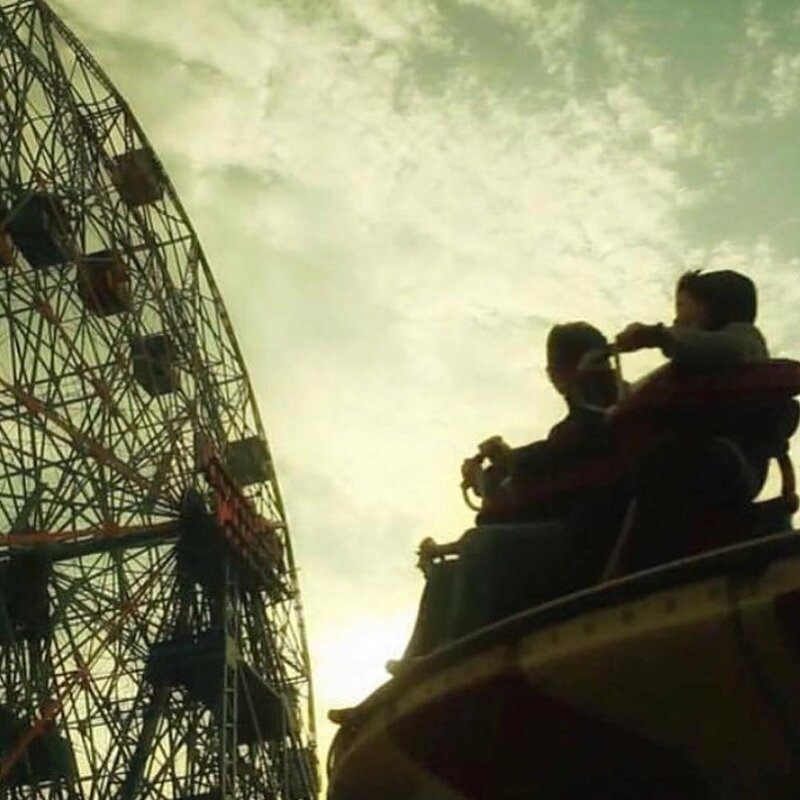 Locals and tourists crowd its beach, the Wonder Wheel and Luna Park, an amusement park featuring the famed Cyclone roller coaster, a fixture since 1927 that has spawned seven clones around the world. The Cyclone was declared a city landmark in 1988 and a National Historic Landmark in 1991. The famous Coney Island boardwalk, street performers, the Circus Sideshow and the Mermaid Parade in June lend an eccentric vibe. Nathan's Famous is known for its July 4th hot-dog eating contest. How do you know you are in NYC? Yellow cabs, pushcarts, the electric pulse in the air might all tip you off. But catch the sight of the Empire State Building and you have stepped into the Big Apple. The iconic building celebrated its 88th anniversary on May 1st, 2018. What happens when someone sees the Empire State Building for the first time in person? Watch this inspiring, breathtaking story to find out. The Empire State Building was built in 1931. Under the direction of architects Shreve, Lamb & Harmon, the framework rises four and a half stories per week. On March 17, 1930, the construction begins. On May 1, 1931, President Hoover presses a button in Washington, D.C. officially opening and turning on the Empire State Building's lights. It took only one year and 45 days to build, or more than seven million man-hours. The famous iconic building played a role in films such as King Kong, An Affair to Remember and Sleepless in Seattle. The building is open every day from 8 a.m. to 2 a.m. From the 86th-floor observatory, you have breath-taking views of all boroughs of New York. Triangle-shaped windows in its crown are lined with lights, creating a beautiful nighttime effect. The giant eagles on its crown are replicas of ones added to Chrysler automobiles in the 1920s. The spire was Walter P. Chrysler idea, and it’s made of special stainless steel. It shines so intensively, that it can be seen from miles by ships at sea.